The trailer has a full width gate and the parking lot had a nice downhill slope, so loading the bike was very easy for George and I. We got it strapped in and left for Border City to double check the straps and how it was riding. All looked good and we headed for Tok, AK, about 90 miles away. 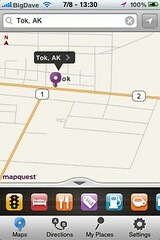 We lost about 4 hours making the trip, but when we returned to Tok and refueled again, we started South. George had driven all night to get to me, so I drove us home. For the most part, I concentrated on driving so he could nap. (He had ridden his bike to Anchorage from Seward to pick up the truck and was planning to ride back to Seward that night when we got back into town.) Once we were to Tok, we made pretty good time and maintained a steady pace. 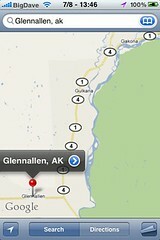 From Glennallen, the road was pretty smooth and once again we were on a good, steady pace. We passed several very cool views which I had seen a lot as the bike run to Eureka Lodge at Mile 128 on the Glenn Highway is a popular one and a lot of fun. 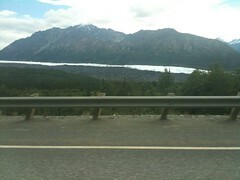 Then we passed the Matanuska Glacier on our way to Chickaloon, AK and King Mountain Lodge, another popular bike destination. We started looking for a car wash with spray wand to rinse off the bike from it's AlCan dust, mud, bugs, etc. Knowing I was going to need to pull the starter when we got home, the thought was it'd be easier if the bike was clean. We stopped in to the one on the North end of Eagle River and the bike got a much needed bath. 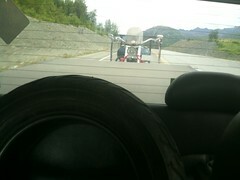 We pulled into Anchorage a little after 5:00 PM and I refueled the truck and we dropped the bike in my garage. George and I were meeting the guys for burgers after 6:00 PM so I had to work fast to get the bike fixed. After pulling the seat and side cover off, I disconnected the battery and the wiring from the starter. 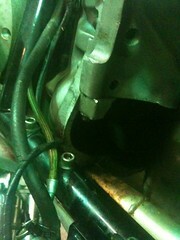 I pulled the back bolt off and the starter fell free! 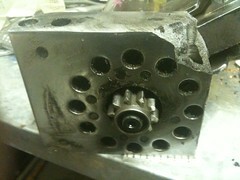 As you can see here, the mounting block for the starter broke. Turns out one of those unexpected pot holes did more damage than I could have imagined. For now, I'm unable to get a good grip on the bolt to get it out, so that's the next step toward getting the starter replaced and the bike running. There are a few other things to do as well, but all in all, the bike held up very well for such a long and rough trip. At least it didn't leave me stranded somewhere completely on my own and I was able to get the help I needed. That'll close this chapter and serious of blogs Grizzly-nauts. I hope you enjoyed this adventure as much as I did. 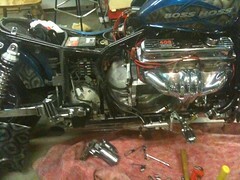 I'll post a blog when the bike is up and running, and am sure to blog about other things as well. Stay tuned!